Enjoy this healthy Cream of Broccoli soup made in the Instant Pot (Pressure Cooker) in less than 30 minutes. This delicious comfort food can be enjoyed guilt free now, with this plant based vegan & gluten free recipe. Perfect for a quick satisfying lunch or dinner. I love making soups in the Instant Pot. You might have guessed as the last few recipes I shared have all been soups. The latest two were so good – Thai Curried Butternut Squash Soup & Vegan Turmeric Cauliflower Soup. And guess what? My husband liked this Vegan Cream of Broccoli Soup more than any of them. If you are looking for an Instant Pot Vegetarian Soup recipe, then this Cream of Broccoli Soup should be on the must try list! Is Cream of Broccoli Soup healthy? 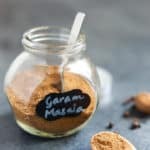 A resounding yes for this recipe! 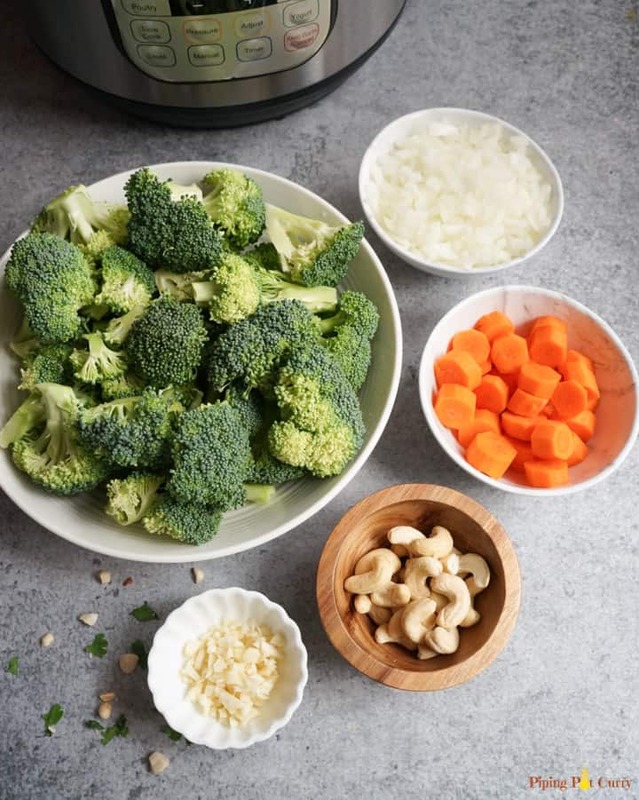 You will find all fresh and clean ingredients in this recipe – broccoli, onions, carrots, cashews, vegetable broth and coconut milk. This cream of broccoli soup is just 265 calories for a single serving. I made this a vegan cream of broccoli soup, with the addition of cashews and coconut milk to make it creamy. I skipped traditional cream in this recipe, but if you like you can always substitute that for coconut milk. I dont add any cheese to this Cream of Broccoli soup as it is already so creamy with the cashews and coconut milk. However if you want to make it nut free, you can add cheese (or vegan cheese) in place of cashews too. Another option is to use potatoes to thicken the soup. 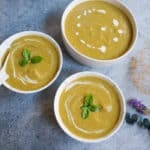 How to make Cream of Broccoli Soup in Instant Pot? 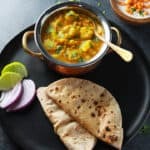 There are very minimal ingredients for this recipe and all of them easily available. 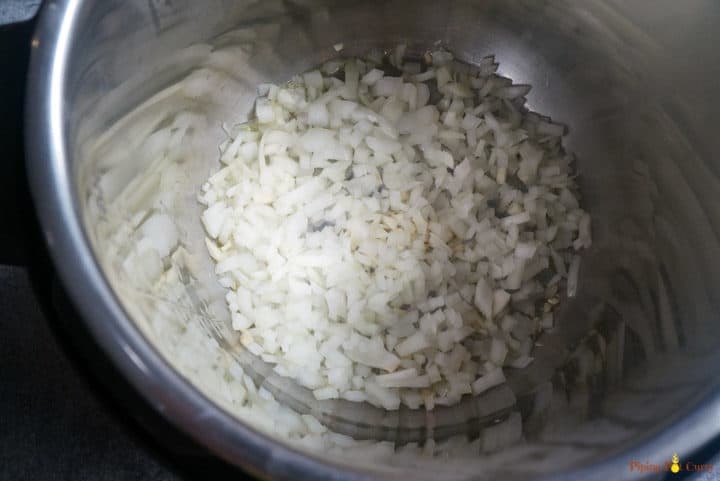 Start the instant pot and saute onions, garlic in hot oil for a few minutes. 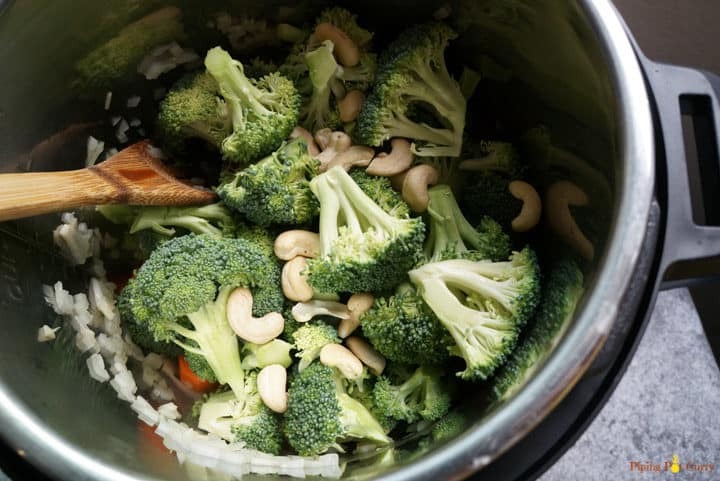 After that this is a dump and go recipe – Add the broccoli, carrots, cashews and broth, then pressure cook. What broth to use for broccoli soup? I like to keep Better than Bouillon in the refrigerator at all times. Making broth is so easy with it. I don’t have to buy cartons of broth that use so much space and are also expensive. I used vegetable broth base in this recipe to make it vegan. You can choose to add the broth of you choice. Once pressure cooking is done, add in the coconut milk and puree using an immersion blender. I find using an immersion blender very convenient as I can puree in the same pot. Less to clean! 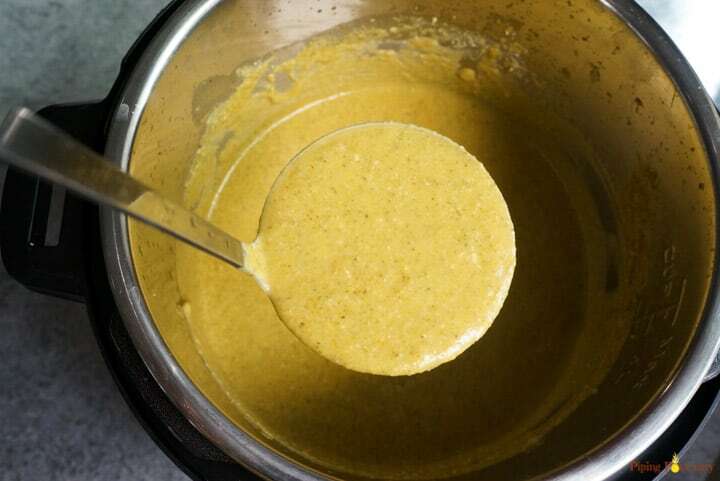 You can also transfer to a blender such as Vitamix to puree the soup. Let the ingredients cool a bit before pureeing in a stand alone blender. Now season the soup to taste and it is all ready for you to enjoy! Isn’t that quick? Wow…I love how easy it is to make healthy soups in the Instant Pot. They are such a perfect meal as the weather is cooling down. How to thicken Cream of Broccoli Soup? Heavy cream – This will include dairy in the soup. Potatoes – The soup is still vegan & gluten free with this option. Cheese – You can use dairy or non-dairy cheese. 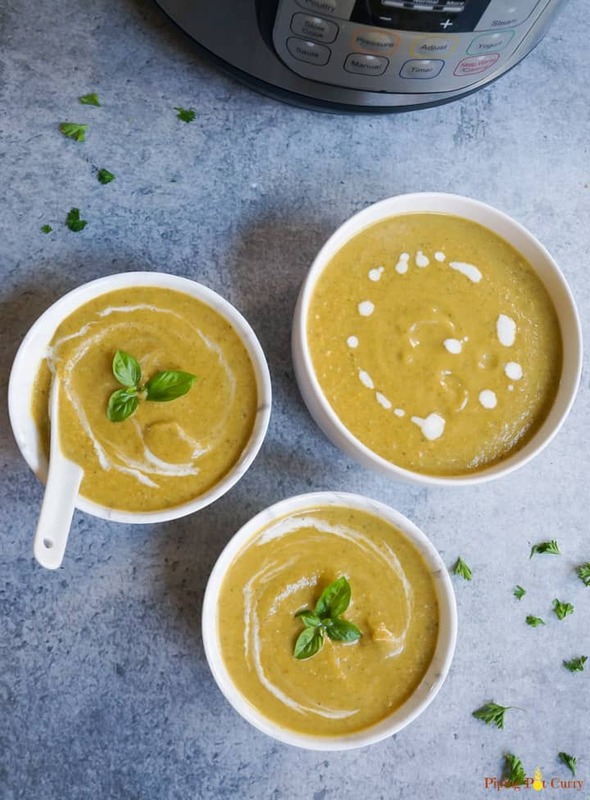 Can this Instant Pot Cream of Broccoli soup be frozen? This soup is dairy-free and hence perfect to freeze. It stays good in the refrigerator for 2-3 days as well. Let the soup cool down completely, then pack in small containers before you freeze, so you are only taking out as needed at a time. What to serve with Cream of Broccoli soup? My favorite side with soup is toasted bread or garlic bread to dunk into the soup. Grilled cheese sandwich is a great side along with any soup. A side salad will pair well too. If you want some meat, then grilled chicken would be great as well. 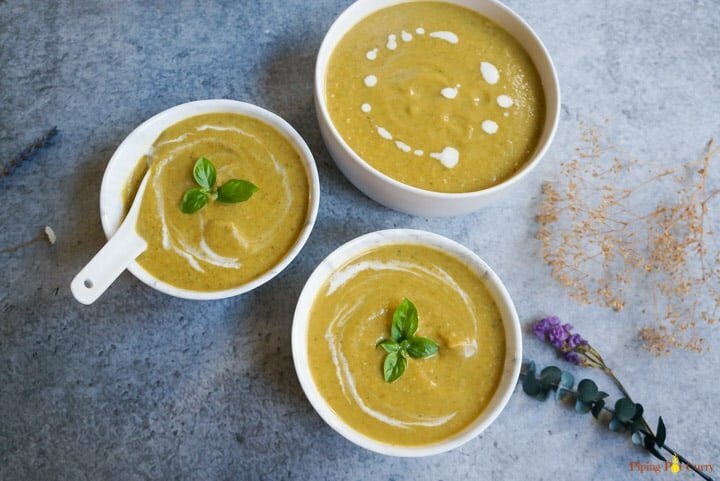 Why you will love this vegetarian Instant Pot Cream of Broccoli Soup? Healthy Cream of Broccoli soup made in the Instant Pot in less than 30 minutes. 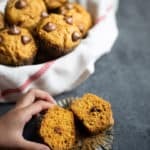 This amazing comfort food can be enjoyed guilt free now, with this plant based vegan & gluten free recipe. Perfect for a quick satisfying lunch or dinner. Add broccoli, carrots, cashews and broth. Stir it all up. Press Cancel and close lid with vent in sealing position. Add coconut milk. 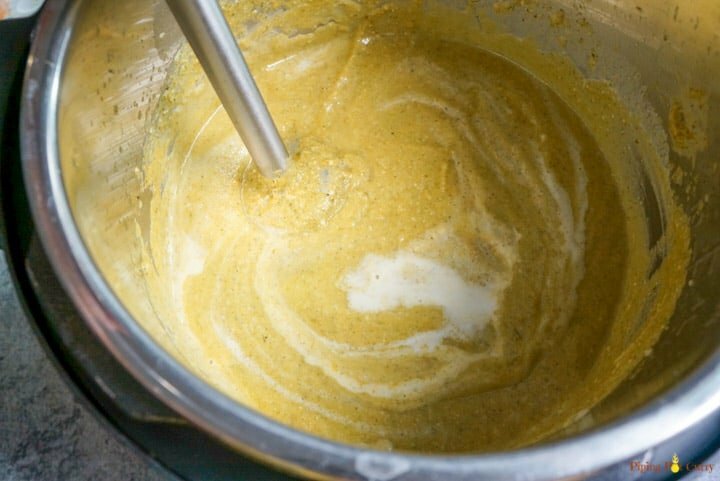 Use an immersion blender to blend the soup to a creamy texture. You can also transfer to a blender such as Vitamix to blend the soup. Be careful while blending to avoid hot splatters. Season the soup with salt, pepper and lemon juice. Top with parsley and basil to garnish. Enjoy with toasted bread! Broth: I used vegetable Better than Bouillon base to make the broth for this soup. You can use any broth of choice. 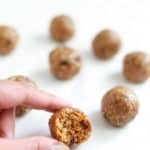 Nut free variation: To make this recipe nut-free, add potato to make it creamy. Another option is to add cheese. Replacement for coconut milk: You can use heavy whipping cream in place of coconut milk. Note that this will make the soup non-vegan. Storing the soup: This soup can be refrigerated for up to 3 days. It can also be frozen. Let the soup cool down completely, then pack in small containers before you freeze, so you are only taking out as needed at a time. Amazing!! So yummy!! I used lite coconut milk (all that I had) and I added some sauteed turnips and leeks that I made this morning as hashbrowns. Perfectly hit the spot for my cream of broccoli soup craving!! Will definately be making again! Hey Sarah – So glad to hear you enjoyed the soup! Just made this with leftover cauliflower and broccoli stalks. It’s wonderful! Thanks for sharing! Hey Christa – So glad you enjoyed it. And great to hear you adding both cauliflower and broccoli to it. Thank you for sharing back your review! Delicious. Anytime my 8 year old son praises a dinner that is based around a green vegetable is what moms call “success”. Oh..I totally agree. Now I wish my 5yo would eat this too. We loved it, but she is not into soups yet. Thank you for sharing back your review! 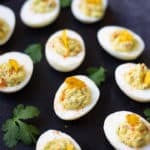 Love how easy and healthy this is! Thanks for sharing! Hey Karly – You are welcome. 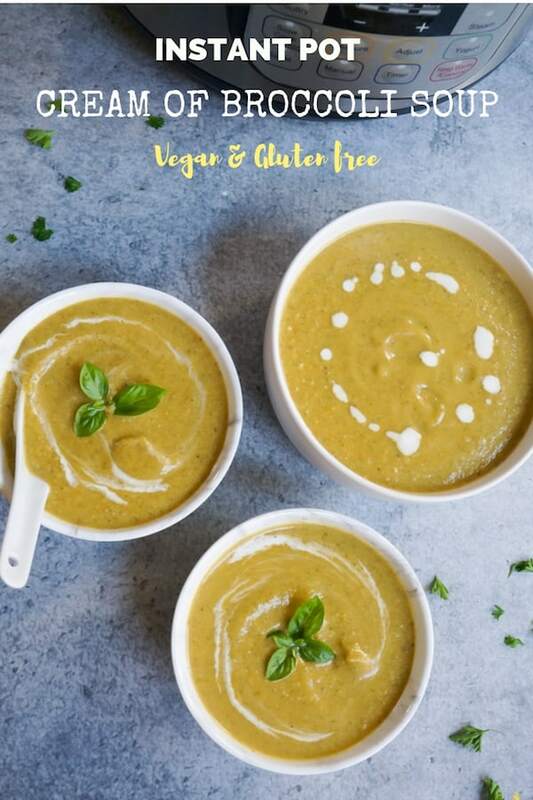 I have been enjoying making these easy healthy soups in the instant pot.